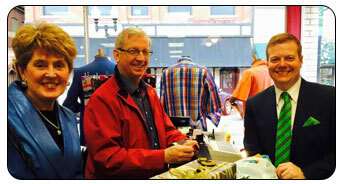 Lapels offers more than just high quality clothing for the fashion-conscious man – we offer years of experience, custom tailoring solutions, friendly service, and an expert eye for men’s fashion. We are constantly ordering newest and hottest stock from top design houses like Bugatchi Uomo, Jack Victor, Robert Graham, and more. 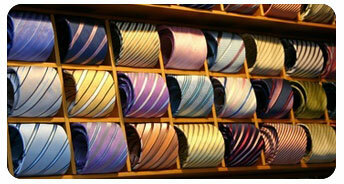 Stop into our location on S. Pennsylvania Avenue in Greensburg, PA and you’ll see what makes Lapels different. In a world where most anything can be bought from your home at the click of a button, our customers come for high-end fashions that are unobtainable elsewhere in the area. However, our customers stay for the personal service, honest opinions, and attention to detail that sets us apart from the rest. We employ a very small, dedicated staff to ensure that every interaction we have is a personal and fulfilling one. If you’ve been to Lapels one time, chances are you’ve met every person who works here. Call us today at 724-853-7145 or contact us online for more information on the lines we carry, the services we offer, and how we can work with you to develop your ideal look. If you are buying as a gift, make sure to ask about our complimentary gift-wrapping service! Your purchases will be beautifully wrapped at no charge! A slightly flared pant-leg, and embroidered emblem on a pocket or collar, a slightly shorter sleeve – the little things make all the difference in distinguishing a true leader from just another member of the crowd. Most of our customers know that we offer clothing modifications to ensure that your outfits fit as well as possible, both physically and stylistically – but did you know that we also offer custom made-to-measure clothing? Our from-the-ground-up made-to-measure designs are made from scratch and custom fit to your body. Unlike tailored clothing, made-to-measure clothes are not mass produced in standardized sizes and sold to fit a range of body shapes. Our made-to-measure designs are sized to fit your exact shape and size before the fabric is even cut from the bolt. Get into the best fitting suit of your life; get into Lapels. We are not your average suit-slingers. We are here to help give you the appearance and confidence that your lifestyle demands. Call us at 724-853-7145 or contact us online and let Lapels help you create or refine your image today.